Last year, when I began walking to work, I started to notice this old Japanese lady taking a walk in the opposite direction. It was uncanny how she always seemed to be precisely on time. If I was on time, I’d cross her at a certain point. A bit late, she’d cross me earlier. Early, she’d cross me when I was almost to work. We would make eye contact some days, but never smile or say hi. She looked like a rather grumpy lady, but passing her by every day started to feel like a daily ritual. 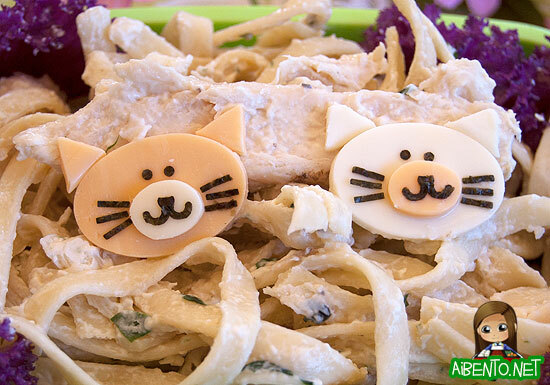 Today’s lunch is just lazy defrosted leftovers topped with some cutie cheese cats. I had two servings of Chicken Alfredo in the freezer and I figured I’d better start eating them before I find it during the summer and just toss it out. Now that Fat and Bloated Week is over, I do seem to be on the decline again. It’s pretty amazing how it’s almost like a light switch. Yesterday I weighed in at 153 even. My most accurate week-to-week progress will probably be next Monday, when late weigh-ins, special occasions, and hormonal imbalances won’t be in the way. Thanks to everyone who has entered my giveaway of The Just Bento Cookbook. I hope you all found my review informative! Be sure to check out another cookbook review I wrote last night for Simply Ming: One-Pot Meals. 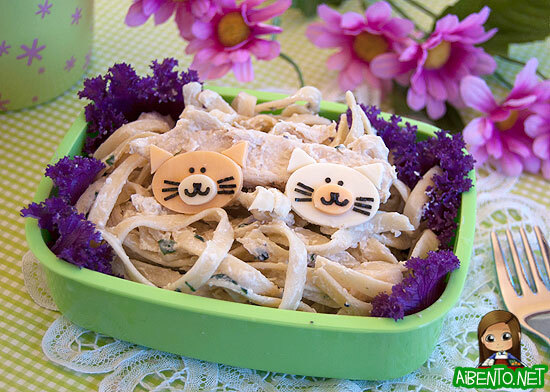 Asian Spaghetti will undoubtedly be making a bento appearance soon!